I don’t even know why I bother mentioning in reviews that I read a book extremely late at night and therefore might not be very coherent. I ALWAYS read books late at night and I’m NEVER coherent. It would be more unusual for me to have a functional sleeping pattern and write reviews as and when I finish a book. Point is. I read this super late at night while having a bad pain day, so it wasn’t easy to form coherent thoughts. But I had to try, because I really, really liked this book. 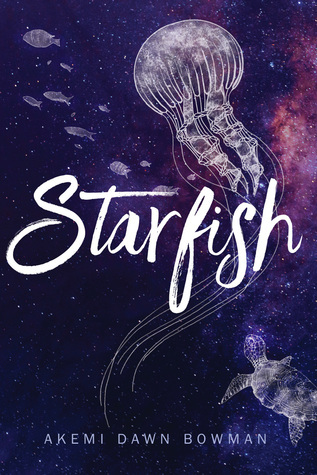 Starfish has got a few major themes: art, anxiety, abuse (oh hey, alliteration), and being Asian-American, specifically half Japanese. I want to talk about that last one first. I’ve read a few books with Asian-American protagonists where I struggled to relate at all, mostly not because I’m white but because I’m not American. But now I realise that maybe they just weren’t as good as this book, because even though I have basically nothing in common with Kiko, I still had a TON of feelings about everything, and it proved that I don’t have to relate to a story to get invested in it. A major aspect of the book is Kiko’s emotionally abusive mother, and it was done so well. It really demonstrated that abuse isn’t always physical, that sometimes it’s not even insults, and that people who say, “I love you,” constantly can be just as bad as those who don’t. There’s a lot of gaslighting and Kiko’s journey is partly about recognising this behaviour for what it is, which she needs to do in order to stand up for herself. It’s also 100% not a story about someone with anxiety who is emotionally traumatised being healed by romance. In fact, it directly subverts that trope. Kiko is interested in romance. She has a love interest who is wonderful and supportive and kind. But she recognises that she’s using him as a crutch and she steps back, because she wants to look after herself first, and she knows that she’s not emotionally ready for a relationship. I think that’s a really important narrative to tell. That said, the book is probably still a little bit too romance-heavy for my tastes, even though I think it was handled really well, so that’s part of why it got four stars instead of five. I also wasn’t 100% keen on the writing style, but that’s just personal taste. Another major aspect of the book is art and here I agree with Cait (@PaperFury) that it reminded me of I’ll Give You The Sun. Mostly because I don’t know of that many books about young artists wanting to get into art school which made me almost cry, so there’s a small pool to compare it to. But there’s definitely a similar vibe — and I agree that if it had had illustrations, that would have been awesome. I didn’t feel that Kiko’s encounter with a mentor figure was entirely realistic (she goes to an art show, her friend Jamie shows the guy her art, the artist becomes her mentor both artistically and emotionally), but I didn’t feel it detracted from the story. Other characters pointed out that it was like something out of her fantasy — it was *supposed* to be unusually lucky. And besides, what’s a bit of wish fulfilment between friends? I think the emotional journey of the characters was the strength of this book; I definitely had a lot of feelings about Kiko and her relationship with her family and her heritage, the latter important because of her mother’s constant undermining of the value of it. I got to the end and was just… emosh. And like I said, I thought the way the romance was handled was really important and sensitive. However, I did regret staying up as late as I did to read this. Why do I always do this to myself? Enjoyed this review? Support my book-buying habit!